Jonas Cream is a former British spy who now works for himself, selling his deadly services the highest bidder. When an old colleague named Harry Lime offers him a lucrative job of collecting a wooden box from a Rumanian auction house, Cream, although weary, accepts the assignment. Shortly thereafter he is approached by the Psychic Branch of the British Secret Service. They want Cream to act as a double agent, carrying out his mission for Lime while actually obtaining the box for them instead. Then he is attacked by a group of foreign assassins known as the Order of the Dragon. They make it quite clear they do not want him to succeed, let alone continue breathing. The first half of Joshua Reynolds’ fast paced thriller reads very much like any modern day spy versus spy novel with all the traditional elements of a Robert Ludlum and John LeCarre espionage mystery. Then it gradually begins to morph into a horror tale as Cream learns exactly what it is all these different factions are after. The box contains the skull of Vlad the Impaler, better known as Dracula. Now Cream finds himself caught in the middle of a deadly tug-of-war between those who want to see the skull destroyed and those who believe, through black magic, the Lord of the Vampires can be brought back to unholy life. Reynolds keeps the action moving at hyper-speed and clearly has fun toying with his all too familiar cast of characters. It takes a great deal of panache to swipe a character from a classic movie. For the uninitiated, actor Orson Wells portrayed American spy Harry Lime in the film THE THIRD MAN. Which is why he is portrayed on the book’s cover, a really wonderful painting by M.D. Jackson. 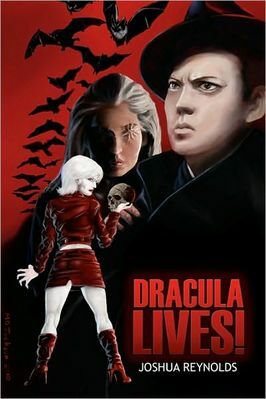 Other players in this book are also named for well known literary spies while others like Ms. Harker are taken from the original DRACULA novel by Bram Stoker. The only weak part of this thoroughly enjoyable book is the fact that it is but the first in a series and the conclusion doesn’t end the story. In fact one could look at the entire novel as only the first chapter in the larger saga Reynolds has planned for the blood-sucking Count. Readers not fond of continued series would do well to avoid this book. As for the rest of us willing to invest our time in an original, gripping horror adventure, I say bravo Mr.Reynolds and where’s book number two? Just wanted to post a Happy Thanksgiving to all my readers here at PFR. I wish you and your families a glorious, fun day. We are all blessed by God in more ways than we can count. It is fitting we take just one day out of the entire year to pause, consider those blessings and give thanks. And as this is the start of the Christmas season, allow me to suggest something to help your gift giving. Give books as gifts. If you've devoted readers in your life, then make them smile with the gift of a book by one of their favorite writers, or better yet, if you know their taste, help introduce them to a new writer. And let's not forget the little ones. Giving a child a book and helping them discover the joys of reading will enrich their lives for years to come. Reading is the one habit I want everyone to have. Again, Happy Holidays to you all, and God Bless. Several years ago, Kevin Noel Olson wrote one of the most imaginative Young Adult book I’d ever read, “Eerey Tocsin in the Cryptoid Zoo.” In it the world met Eridona “Eerey” Tocsin, a precocious red headed girl with a knack for meeting and making friends with all manner of weird creatures. From her black widow spider, Eight Ball, to the Loofah, the half centaur/half orangutan, this girl was a magnet for some truly amazing adventures. Olson has since written two sequels that have been sitting on my To-Read stack for some time now. Sadly we reviewers do not spend all day reading, as much as we’d like to. There are things like gas and light bills to pay, i.e. the regular obligations of life. Whereas ever day more and more books arrive and that stack never seems to dwindle at all. So it is just matter of spacing out titles and offering myself and you a diverse line-up of reading experiences. It was time for Eerey’s second book. At the end of that first tale, Eerey and her strange companions were flying off to try and locate her missing parents. Along with them was her cousin Edict, a boy covered with hair and Guy, the invisible lad who buzzes whenever he comes under harsh lights. 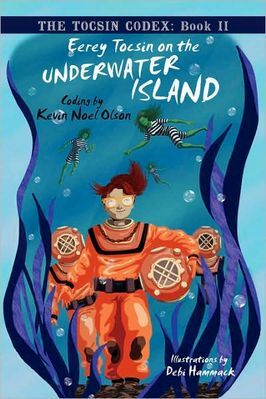 They crash land near a dormant volcano in the middle of the ocean and soon find it leads to the underwater city of Kanute. There, the group is caught up in a battle between the green skinned humanoid Kanutians and the amphibious Ottermen. Once again, Olson delivers a completely original story filled with giant robot sharks and an even bigger, miles long crustacean known as the Kraken. The action never stops as Eerey and her pals find themselves in one cliff-hanger peril after another, all the while relying on their courage and friendship to see them through. Which is the true heart of these adventures; that no matter how amazing or frightening life can be, we all do succeed with a little help from our friends. In the past five years, since I started to examine and review the pulp genre field, it soon became clear that there were only two really different types of pulp stories. The first is that of the lone avenger/vigilante who works outside the law to battle the bad guys. The second is the team approach wherein we are given a group of characters who act in unison to achieve the same noble goals. Generally, when reading a new pulp title, I can easily drop it into one of these two branches. It is not often that a book comes along that doesn’t fit in either of those molds as much a break them completely and provide us with a brand new spin on things. KNIGHTS OF THE SALTIER is such book and thus an eye opening pleasure for this reviewer. It is something new under the pulp umbrella and extremely well realized. Secret fraternal organizations ala the Masons have been around for hundreds of years and have been the fodder for many a pulp adventure. From the Illuminati to the Harvard Skull and Crossbones club, the idea of a group working in the shadows to bring about political and social change has been a well worn plot device to entice paranoiac readers of every generation. What Saltier proposes in this, the first of a trilogy, is that a modern secret society has come into existence with the sole purpose of aiding the police in helping to bring criminals to justice. The group is based on the old English order of chivalry and its members, called Knights and Dames, take an oath of loyalty and secrecy to the group when being inducted. At one point in the story, the Grand Master explains to the protagonist that the only way the group can exist, per its own ideals of civilized jurisprudence is to support the legal system and never usurp the goals and authority of the police. To do so would make them no better than the people they investigate and capture. Their role is to gather evidence, behind the scenes, that will convict the law breakers, then apprehend them and deliver them, along with that data to the police. Thus the public remains totally unaware of their existence and operations, continuing to believe that the established legal system works as it should. Thus the secrecy element is crucial as is their group loyalty. No single individual is unique or exceptional, each Knight and Dame is a vital component of the group. Which is why this particular concept is original to pulps and cleverly thought out. 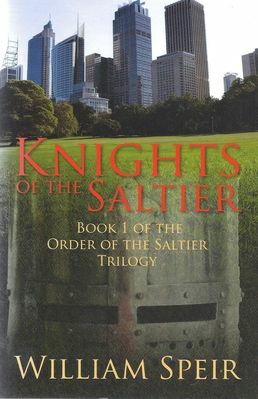 The philosophy behind the Knights of the Saltier (a symbolic cross shaped like the letter X) is central to the book’s plot and the hero’s reaction to it. Tom Anderson is an ex-military engineer looking for a cause to give his life purpose. It isn’t enough to work, get paid and socialize with friends. Anderson, in part due to his inherent patriotism, believes he has more to give his country, but as a civilian is stymied in finding an answer to his moral quest. When he is approached by the Knights, he is reasonably suspicious of them and their stated mission. Most secret organizations are radical in nature, which is why the Knight’s tempered existence intrigues him and he ultimately comes to accept their offer. Once an active member of the Knights, Anderson also discovers the groups singular vulnerably, their exposure to the criminal world that they are helping the police combat. When one of their members turns traitor and gives up the Knights to a brutal mob boss, Anderson and his new found brothers find themselves in a pitched battle for survival. The repercussions are savage and their very struggle to survive challenges the Knights with their greatest dilemma of becoming the very things they abhor. KNIGHTS OF THE SALTIER is a fascinating book. Speir’s writing is competent enough, although I hope as it matures; it will take on more color and verve that comes with confidence. I sense he is still feeling his way down this new literary path he’s taken on. I strongly recommend KNIGHTS OF THE SALTIER to all pulp fans. It’s not often we get something this original in the genre, don’t let it pass you by. The writing in this book is so lean, it becomes a literary illusion as it packs so much story in those economic words. That is the hallmark of a veteran writer who has truly mastered his craft of storytelling. Whereas I do not read many westerns, it is both a joy and sad event to come to this dance late, as Kelton passed away in 2009 at the age of 83 with over fifty novels to his credit, among them seven winners of the prestigious Spur Award. TEXAS STANDOFF is one of two books being posthumously published. It is marvelous example of excellence in the genre. The authenticity of the setting, the language of the characters and their laconic, leather tough personalities open a window to a way of life and culture that forever shaped this country’s identity. Veteran Rangers Andy Pickard and Logan Daggett are sent to a small town in the central Texas country to investigate an increasingly dangerous feud building up between two cattle ranchers, the Teals and McIntoshs. The patriarchs were old foes in the Civil War and remain stubbornly unwilling to put their past prejudices aside, each accusing the other of starting the ruckus with the intent of driving out the competition. The two Rangers soon discover a volatile atmosphere in which the smallest spark could ignite a bloody range war that would decimate both families and kill many innocent bystanders caught in the middle. No sooner do Pickard and Daggett start nosing around when a series of violent attacks by hooded riders known “regulators” begin targeting both ranches. Both sides vehemently accuse the other of these raids whereas Pickard begins to suspect a third group is actually manipulating events to pit the cattle ranchers against each other. Pickard, the younger of the two lawmen, is the thinker, slow to act but nonetheless lethal with deadly marksmanship when required. Daggett is older and a bulldog of man who believes in swift and permanent justice to all outlaws, no matter the severity of their crimes. His philosophy is hang them all and make room for the decent folks to settle the land. Much of the fun here is seeing how both men, despite their differences, have to learn to work together in completing their assignment and uncovering the truth behind the entire affair. TEXAS STANDOFF echoes classic westerns such as the Virginian and Lonesome Dove but it also brands itself with a fresh, honest originality by portraying these characters as the true, tough and independent pioneers they were. If you’ve a hankering for an easy paced western that delivers so much more, then saddle up and enjoy the ride. This one has your brand on it. This is easily one of my favorite on-going pulp series. 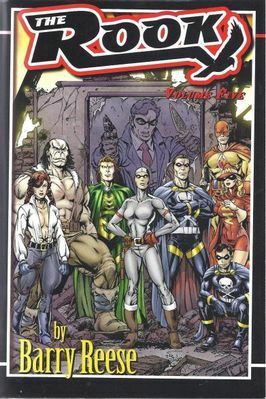 The Rook, an Atlanta based avenger a new pulp hero who, over the course of his four previous outings, has battled some classic pulp villains and teamed up with well known 30s heroes along the way. Note, this is not a novel, as the Rook’s adventures generally run in lengths of ten to fifteen thousand words and each volume is a collection of four or five of these long tales. This one follows that format and offers up four new Rook thrillers and wraps with a bonus story by writer Stacy Dooks. I’m going to “hazard” a guess and say this is the first Rook story ever penned by someone other than Reese and it’s really very good, adhering a great deal the established style Reese created for this series. The recurring theme of this collection focuses on the Rook establishing a new team of heroes he christens the Claws of the Rook, and they include a pastiche female Phantom type warrior known as the Revenant, who leads them. Others include a master of the mystic arts, ala Doctor Strange, the Frankenstein monster who is, in this incarnation, a decent fellow named Vincent and the Golden Age comic book battler, the Black Terror, to name a few. During the course of the book they go up against some of the Rook’s old foes such the Warlike Manchu and Doctor Satan while being challenged by new evils ala a wooden fiend known as the Stickman and a resurrected vampire Hitler seeking to rebuild the Third Reich. As you can see by these colorful personages, these are off-the-wall pulp exploits in the finest sense. There are times when Reese spends a little more time on the new team then he does with his principle hero and all too often, despite their myriad talents and powers, the group can’t seem to win any decisive battle without his coming to their rescue. Obvious the challenge here is when to shine the light on the Max Davies, the Rook’s secret identity, and when to actually let him take a back seat. The few times this doesn’t work properly makes for awkward sections that slow down the pacing a bit. But that’s a truly minor flaw in what is another excellent entry into this fun series. And Dooks tale starring the Rook Jr. is a really nice bonus to the entire package. If you are a Rook fan, you won’t be disappointed. If you aren’t, then time to get on the pulp bandwagon and discover this truly excellent series.